Suits were suited. Boots were booted. Helmets checked. The lights went green ….and then they were off! 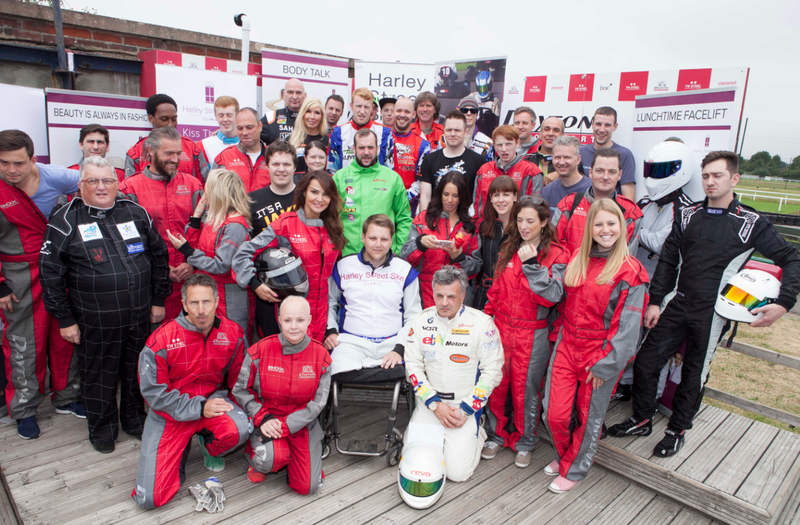 Yes, the second Back on Track Celebrity v injured heroes was under way. And the heroes gave no quarter…..they were round the Daytona Track in Sandown like demons, overtaking anyone who got in their path. Mind you the celebrities gave as good as they got, and the likes of Andrea McClean, Lizzie Cundy, Gail Porter, Lemar, Dr. Emily Grossman and Olivia Birchenough (looking way too glamorous..even with helmet hair!) got their own back. Cheered on by Melinda Messenger, Claire Richards and Johnson Beharry VC, at one point the girls teams were in the lead, which shook the boys up a tad, but after a while the soldiers stormed to take the top places. It was all great fun though and everyone had a wonderful time. In the end, 1st place was awarded to ReCell Rovers – 4 injured servicement – with second and third places going to Top Gear Experience 4 and 1 respectively. Good to see that the soldiers beat the ace drivers from such a wonderful motoring show! Back on Track is the brainchild of Lesley Reynolds, and her husband Dr. Aamer Khan, and because they work closely with many injured soldiers they know how important it is for these boys (and girls) to build a normal life and to enjoy challenging sports such as racing. £8.000 was raised this time , but plans are underway for this to become an annual event, with the aim of raising even more money next time so that more soldiers can take to the tracks. This entry was posted in Harley Street Skin Clinic, Lesley Reynolds, Uncategorized and tagged Andrea McLean, anti ageing, charity, claire richards, daytona, gail porter, go carting, lemar, melinda messenger, racing day, steps, the stig, top gear. Bookmark the permalink.